These terms and conditions apply to the use of this Website and by accessing this Website and/or placing an order you agree to be bound by the terms and conditions set out below. If you do not agree to be bound by these terms and conditions, you will not be able to buy any products from us. 2.1. 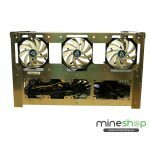 Mining hardware limited company based in Dundalk, Ireland. 2.2. “DIY System Build” means the sale by mineshop of a package of all the components needed for the self-assembly of a computer system by the Customer. 2.3. “Price” means the price paid by the Customer for the Product excluding carriage and any credit surcharge. The Price is stated on the mineshop Order Confirmation. 2.4. “Order Confirmation” means the acknowledgement of the Customer´s order sent to the Customer by mineshop. 2.5 “Dispatch Email” means the email sent to the Customer to confirm their order is accepted and the goods dispatched. 3.2 After placing an order, mineshop will send an Order Confirmation to you. Please note that this does not mean that your order has been accepted. Your order constitutes an offer to buy a product. All orders are subject to acceptance and we will confirm such acceptance by sending an email to you confirming our acceptance of your order and dispatch. The contract between us will be formed when we send the Dispatch Email. 3.4.All descriptions, photographs and advertising are solely to provide an idea of the products they describe. While we take every care with our descriptions, errors may occur, and are excepted from the contract if very minor. Images are for illustrative purposes only. 3.5 Payment can be made by credit or debit card, cash,WU, bank tranfer,Bitcoin, Ether. We cannot dispatch any Products until we have cleared funds. If you are using as your payment method we reserve the right not to ship to unconfirmed addresses. 3.6 If payment is made by credit or debit card, we reserve the right to make delivery to the statement address of the cardholder. 3.7 Credit/Debit card details are taken for click and collect/call and collect orders but will not be charged unless you fail to collect in which case we reserve the right to charge a handling fee of 10% (minimum 5.00). 3.9. If the pricing error is obvious and could have reasonably been recognised as a mis-pricing, we will be under no obligation to provide the Product even after despatch. 4.1. You may cancel your purchase at any time within 14 days of receipt and we will give you a refund in accordance with our Returns Policy. Some items are not covered by this clause; please refer to our Returns Policy for further details. You must inform Mineshop in writing and return the Products to us immediately in the same condition you received them, at your own cost and risk. We recommend you follow our packaging guidelines and return via recorded delivery as we cannot be liable for goods damaged or lost in transit to us. 4.2 If a Product is faulty or delivered in error then please refer to our Returns Policy and clause 5 below. 4.3. If you wish to return Products not covered by clause 4.1 or 4.2 above then such Products will be accepted at the discretion of mineshop. You must obtain a RMA number from mineshop and quote this when returning the goods. You will be credited with the current market price. 5.1. Any delivery date stated is a warranty by mineshop to use reasonable endeavours to effect delivery by that date. No liability will be accepted by mineshop for failure to meet a stated delivery date, apart from the Guaranteed Next Day Delivery service which may apply in which case our liability is limited to a refund of the carriage of the order. If a product is delivered to you in error and is not what you ordered, then you must contact Customer Services who will arrange for collection, and for the correct product to be delivered (if applicable). 5.2.2. If a Product has been lost or is short, within 5 days of delivery. 5.2.3. A claim for loss or damage may not be allowed if the you claim outside the above time limit. 6.2. You should return the Product in its original packaging to Mineshop at the address above. Prior authorization must be obtained for any returns by contacting Mineshop customer services and obtaining a RMA number, which must be quoted in any correspondence. You must back up all data as we cannot guarantee your data during repairs or testing. 6.3. All Products other than DIY System Build are sold as individual components. All returns must comprise of only the defective Product. 6.4. If any item is returned which is found not to be faulty by our technicians, then a charge will be made for return carriage insurance and administration. 6.5. This clause does not affect your statutory rights. 7.1 We warrant to you that any Product purchased from us through our site is of satisfactory quality and reasonably fit for all the purposes for which products of that kind are commonly supplied. This warranty does not apply to any defect in the Product arising from fair wear and tear, willful damage, accident, negligence by you or any third party, if you use the Product in a way that we do not recommend, your failure to follow instructions, or any alterations or repair you carry out without our prior written approval. 7.2 You accept that any Products purchased which are listed as Clearance have a warranty of 90 days unless otherwise stated on the item description. 7.3 Our liability for losses you suffer as a result of us breaching this agreement is strictly limited to the purchase price of the Product you purchased. 7.4.5 for any matter for which it would be illegal for us to exclude, or attempt to exclude, our liability. 7.5.6 waste of management or office time however arising and whether caused by tort (including negligence), breach of contract or otherwise, even if foreseeable, provided that this clause 7.5 shall not prevent claims for loss of or damage to your tangible property that fall within the terms of clause 7.1 or any other claims for direct financial loss that are not excluded by any of clauses 7.5.1 to 7.5.6 inclusive of this clause 7.5. 8.1. In case of delays caused by circumstances beyond the control of Mineshop or its suppliers, Mineshop shall have the right to either suspend delivery or to cancel the contract without liability. 8.2. Examples of Uncontrollable Events are (by way of example and not limited to) natural disasters, flood, strike, lockout, riot, revolution, war, epidemic, working difficulties, transportation difficulties, fire, and failure of suppliers or official regulations. 9.1 If you order Products from our site for delivery outside the Ireland, they may be subject to export/import duties and taxes which are levied when the delivery reaches the specified destination. You will be responsible for payment of any such import duties and taxes. Please note that we have no control over these charges and cannot predict their amount. Please contact your local customs office for further information before placing your order. 9.2 You must comply with all applicable laws and regulations of the country for which the Products are destined. We will not be liable for any breach by you of any such laws. 10.4. You must provide reasonable courtesy information and co-operation to Mineshop. We will rely on these terms and conditions and any documents referred to in them in relation to any contract between us. Please make sure any variations to there are confirmed in writing by a director. 12.1 “Marketing Emails” refers to any promotional email communication. The information transmitted in these emails is intended only for the person(s) or entity to which it is addressed and may contain proprietary, confidential and/or privileged material. If you have received an email in error, please contact the sender. Although the emails and any attachments are believed to be free of any virus, it is the responsibility of the recipient to ensure that they are virus free and no responsibility is accepted by the sender for any loss or damage arising in any way from the receipt or use thereof. Errors and omissions are excepted. Images are used for illustrative purposes only. Prices valid for the indicated time period only. Offer pricing only available on the online store. Retail prices apply through the Trade Counter and Telephone Sales. 13.2 Contracts for the purchase of Products and any dispute or claim arising therefrom are subject to the jurisdiction of the courts of England and Wales. From time to time we may need to update these terms and conditions to reflect changes in legislation, the marketplace or company policy. The contract will be subject to those terms and conditions in force at the time of the formation of the contact – ie on the date of the Dispatch Email.